HYPERTENSIVE & NEEDING MEDICATIONS FOR LIFE? THE REALITY. Blood flows through blood vessels in the human body at a particular pressure but for some reasons or what still proves to be an unknown dilemma to medical scientists in majority of cases, this pressure goes "HYPER-",becoming abnormally high and uncontrollable,unless by Anti-Hypertensive medications. "Mathew Johnson Esq. is a 35 year old legal practitioner and newly diagnosed hypertensive who is finding it difficult to accept the fact that, if his blood pressure is not controlled after a period of strict dietary/lifestyle modification, he will be needing medications for the rest of his life". What is the reality? 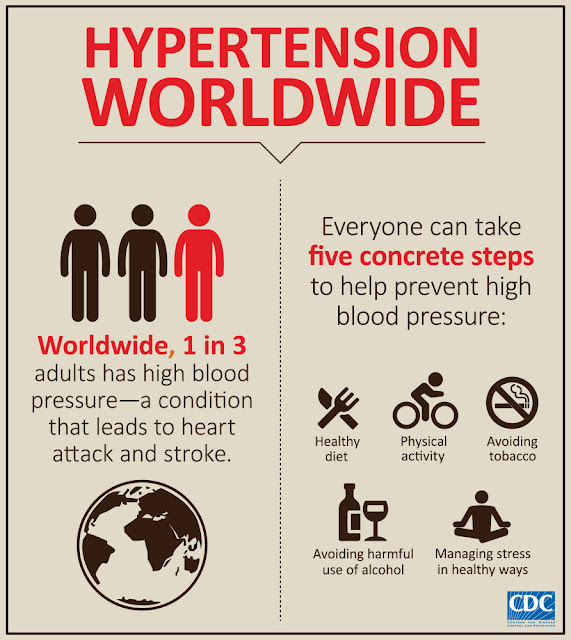 World Health Organisation (WHO) statistics reveal that approximately 1.13 billion individuals are hypertensive world wide. Other Organisations like The Centres for Disease Control and Prevention (CDC) have equated figures from their own research to amount to 1 in every 3 individual worldwide. The good news is that, this condition can be prevented in some cases as outlined in the CDC Infographic above. 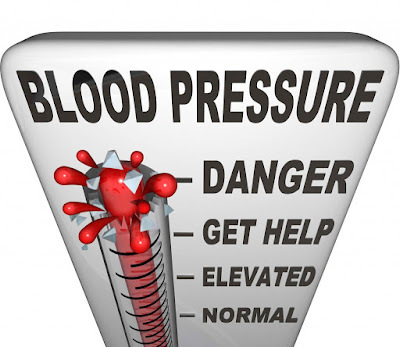 The reality is that,if complications of hypertension like:hemorrhagic stroke(blood vessel rupture in the brain),chronic kidney disease,heart attack and the likes are to be avoided,then diagnosed patients must continue on their anti-hypertensives as prescribed by their Physicians. All other things being equal, would you rather be medication compliant and live to adorable old age? Or would you wallow in denial and stand the risk of suffering complications? Our candid advise is that, whilst continuing with a healthy diet and exercise invigorated lifestyle,keep up with the medications and go for regular health checks. 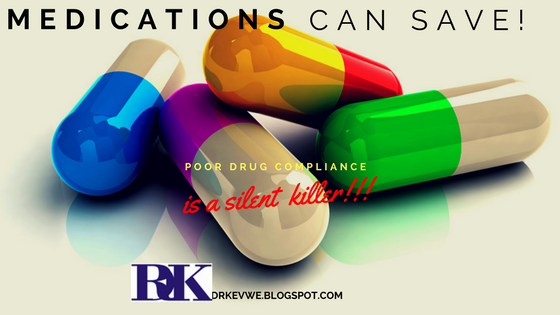 Poor drug compliance is a silent killer. For more information on Hypertension, see references below. Very informative, A lifestyle change is always d key to unlocking the door to a better health.